A three tiered bespoke princess castle cake, personalised with your favourite princess, name & age etc. Take a look at our celebration cake gallery. X9 Tabletop princess balloons bouquets in your chosen colours. x2 Cake stands with customised cupcakes. View our cupcake gallery for inspiration. X4 Large princess balloon castle pillars. Connecting helium princess balloons arch. Princess cake table dressed with tablecloth, runner & cake stands. If you would like to upgrade, swap or personalise any princess balloons please see our chart for prices and more information. Check out our popular candy buffets perfect for any princess party! We take your favourite princess and create personalised sweets and treats in an amazing display. 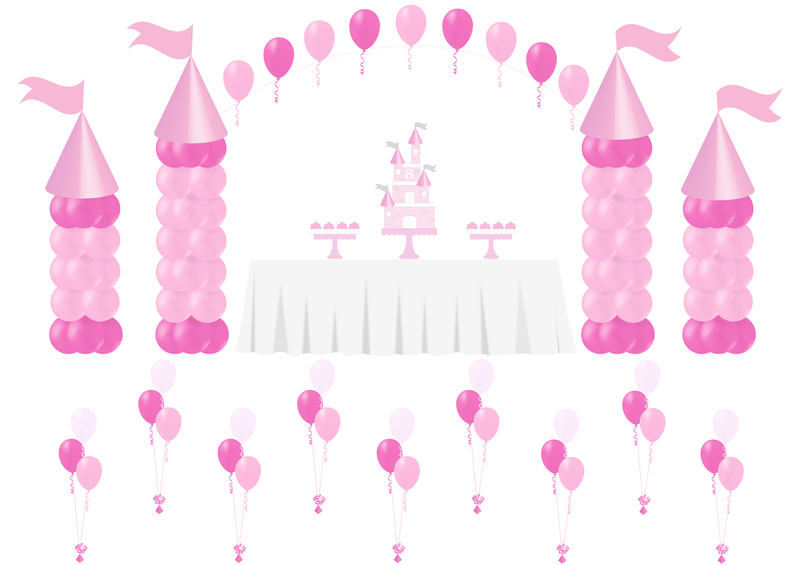 X9 Tabletop princess balloons bouquets in your chosen colours.x2 Cake stands with customised cupcakes. View our cupcake gallery for inspiration. To hire our pink table runners and chair covers please contact us for more information. To add extra princess balloons see our price chart for more information. Turn your princess cake table into a show stopping candy buffet with jars and platters of sweets and treats in a beautifully detailed display. View our candy buffet gallery for inspiration. Antonia’s Ice cream sunday bar. Elegantly displayed toppings and treats with delicious ice cream in personalised monogrammed ice cream tubs. Contact us for more information. For additional princess balloon bouquets see our price chart for more information. 25% off Candy floss cart hire when ordering cake/balloons from Antonia’s.